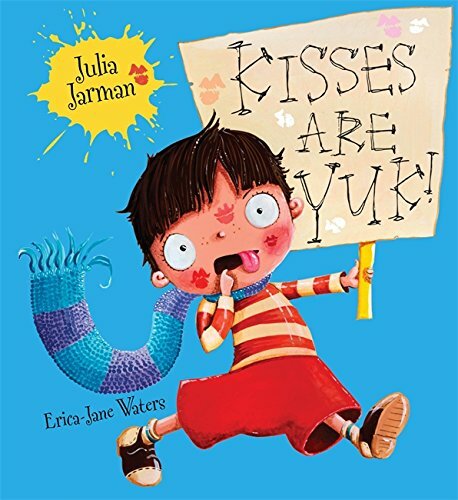 In this rollicking rhyming read-aloud tale Jack just HATES kisses! Yet, with his large family of uncles and aunts, how can he escape them? Jack does all kinds of brave deeds (saving others from a lake, a burning house, and from the jaws of a lion) and he would prefer a manly handshake; but as for yukky, sucky kisses… Granny Groover kisses ‘like a hoover’, but worst of all is Auntie Rhonda who kisses ‘like an…’ But that would spoil the tale! Jack decides to become Macho man, spurning kisses of all kinds, and it is only right at the end that readers learn his secret habit… a bed full of cuddly toys, and a goodnight kiss and hug from Mum! With hilarious pictures, closely following the rhyming text, this is a book with much to giggle over, as Jack struggles with his abundantly affectionate family.